HomeBlogSEOHow will the changes to Google’s ad layout affect paid search performance? On Friday 19th February, Google announced that ads will no longer show on the right sidebar for desktop search results pages. There will be four text ads instead of three showing at the top of the page, and three at the bottom of the page. So how will these changes affect your paid search campaigns? Desktop search result pages will not show any text ads on the right sidebar. There will be up to four ads at the top of the page and three at the bottom, adding up to seven ads in total (down from the previous maximum of 11). Product Listing Ads and Knowledge Panels will now show on the right sidebar for relevant search queries. This change has been applied across the world from Monday 22nd February on both Google Search and Search Partners. Google have actually been testing this for a small number of search queries for a while now, and has been testing new layouts for several years. Google have stated that “this is designed for highly commercial queries where the layout is able to provide more relevant results for people searching and better performance for advertisers.” This basically means that this change is meant to provide better performance for targeting users with intent to purchase. At the moment, there is plenty of speculation as to how key metrics for your search campaigns will be affected, but there is no evidence to back any of this up. Some people think it will cause cost per clicks (CPCs) to go up, but just as many people say the complete opposite. Click Consult are driven by data rather than speculation, so we have been closely monitoring how ads at the top of the page and other positions are being affected by these changes. We have compared click through rate (CTR) and average CPCs across all of the AdWords accounts we control, removing all Mobile, Tablet, Shopping, and Display traffic so that we only have data using Google Search ads. We have also removed any Own Brand campaigns so that we are only using keywords that will have some competition for bids. The results we have found over the past two weeks have been interesting. 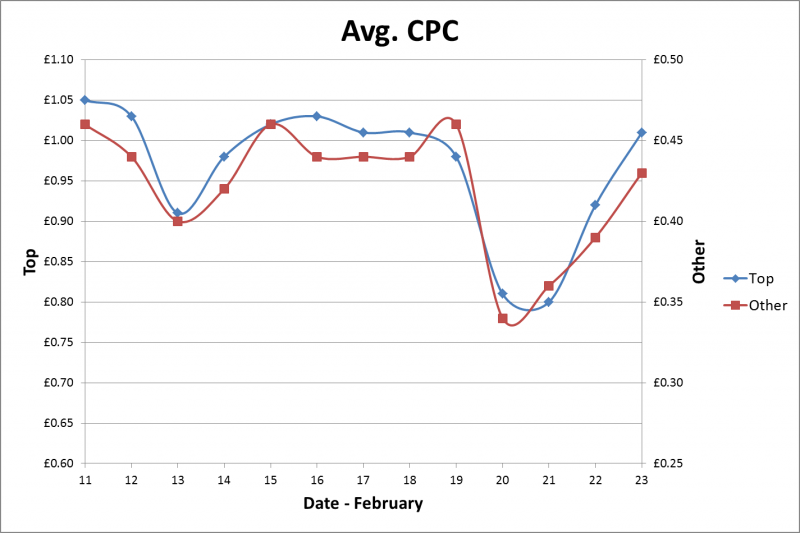 Average CPC does not appear to have changed for either ‘Top’ (the top 3 or 4 ads) or ‘Other’ (ads on the right sidebar or at the bottom of the page), with both placements only experiencing seasonal and weekly trends. 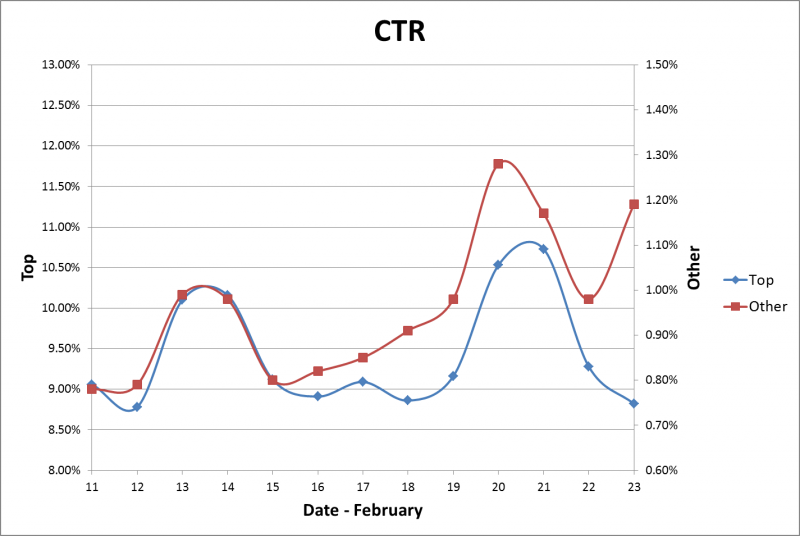 Whilst most people thought CTR would be affected, the way it has changed will probably surprise most – in that the top ads seem to have only experienced seasonal and weekly trends, while ‘Other’ placements seem to have an increased CTR. The data would seem to suggest that ads on the right hand side of search engine results pages (SERPs) were actually receiving fewer clicks than they would have received at the bottom of the page. We began adapting our paid search strategies the moment we received advanced notice of the pending change, but we will continue to monitor all changes to all key metrics over the next few weeks and share more data and analysis as things progress. Looking for more? Take a look at our other blogs and resources, or say hi!